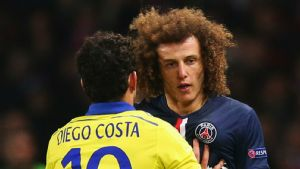 David Luiz says Diego Costa would be welcome at Paris Saint-Germain should the Chelsea striker ever want to leave England, and has praised the confrontational Brazilian as “a good friend” off the field. Costa, 27, has struggled this season after leading the Blues to a wire-to-wire Premier League title last campaign. The Spain international has scored just seven goals in 18 league matches thus far and has been forced to answer questions about his happiness at the club following clashes with former coach Jose Mourinho. With Costa repeatedly linked to a move away from Stamford Bridge, Luiz has told the Mirror that PSG would happily greet the arrival of one of Europe’s top strikers. “Diego is one of the most clinical strikers in Europe, he would be a welcome addition to any team,” Luiz said on Monday. “I think PSG have made their intent clear over the last three or four seasons, that we only add the best players. Luiz and Costa clashed a number of times in their clubs’ Champions League last-16 second-leg tie last March — a game in which Luiz scored. However the affable defender says the former Atletico Madrid man has two sides. “Diego and myself have had our clashes on the field, but you must understand there are two Diegos. “On the field he is physical, he is confrontational, he will get in your face, that is part of his game. PSG and Chelsea will face each other in the Champions League round of 16 again next month. Luiz warns the Blues, despite their poor league standing, are not to be underestimated.